Meet Cory Johnson, our new graphic designer. 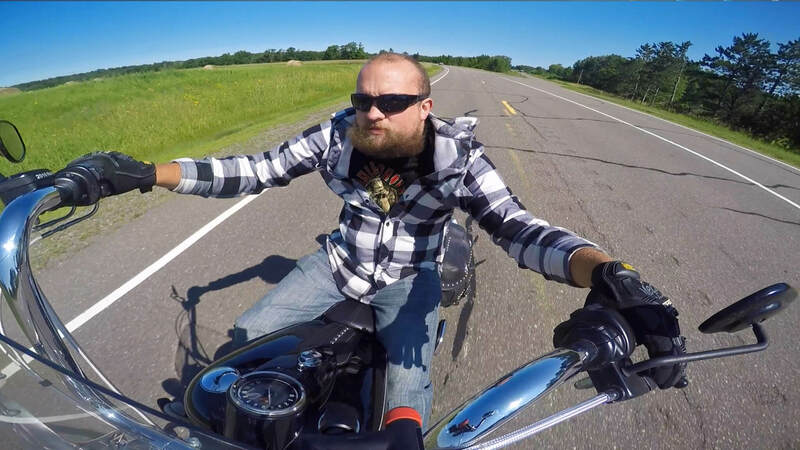 Meet Cory Johnson, RedHouseMedia’s new graphic designer and dedicated Harley rider. With a bachelor’s degree in design technology—including graphic design, digital media, and exhibit design—plus three years of professional graphic design experience in the gaming industry, Cory will provide our clients with a wide range of design products, from print to web and video. Read on to learn more about the newest member of our creative team! Q: How did you end up as a graphic designer? A: As a kid, I loved playing video games. When I became interested in how they worked, it led to an interest in computers. I also loved art and was always drawing or making something. When my art teacher told me a career in graphic design combined art and computers—I was hooked! Q: You grew up in Rochester, so how did you end up going to college in Bemidji? A: I guess I can thank (or blame!) the weather. My family was vacationing near Bemidji and on a rainy day with nothing else to do, I decided to check out the campus. That was all it took. I’ve always loved the northwoods and Bemidji had it all with the lake and trees—and a great graphic design program. Q: What kind of art do you do in your free time? A: I hang out with family and friends in the summer, so not much art happens then. This may sound a little odd, but my yard has a lot of rocks and I like stacking them. Finding and positioning the perfect rock in the perfect spot is relaxing. I enjoy digital painting on my Wacom tablet as well—especially pet portraits. And just for fun, I’m working on a bottle cap mosaic of “The Great Wave” (a Japanese painting). I ran out of white bottle caps to finish a wave section, though. They’re harder to come by. If anyone has any, let me know! Q: Tell us about your family. Q: We’ve heard you rumble down the street when you’re coming to work. Tell us about your sweet ride. A: It’s a Harley Davidson 2012 Heritage Softail, with a 103 cubic inch (1690cc) motor. I bought it used from a local pilot, so it was in immaculate condition with only 5,800 miles. It rides like a Cadillac compared to my old Harley Sportster. Q: You said your new loud pipes help with road safety? A: I’ve always said that loud pipes save lives. When someone begins merging into my lane, I crack the throttle and they know I’m there. I also changed the air cleaner for one that brings more air in so it cools down quicker and will go faster. Q: How fast could it go? A: It could hit 95–100 mph if I opened it up.